Local college students presented their summer research at UConn Health on Aug. 1 during ‘Innovation Fellows Research Day,’ an event that showcased a newly launched statewide consortium known as Partnership for Innovation and Education (PIE). 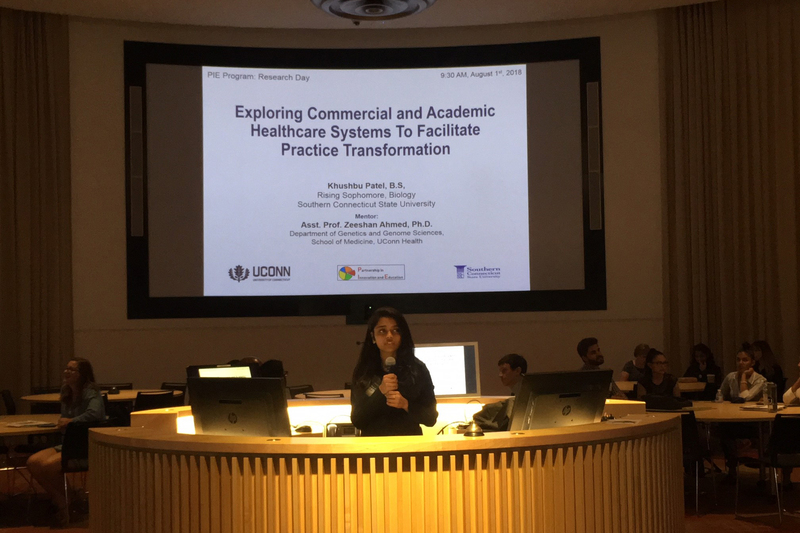 The event, held in UConn Health’s Academic Rotunda, featured short talks and poster presentations describing innovative research projects by the inaugural class of 79 PIE summer program fellows. The students hail from seven institutions: UConn, Trinity College, University of St. Joseph, Central Connecticut State University (CCSU), Southern Connecticut State University (SCSU), University of Hartford, and Tunxis Community College. The long-term goals of the program are to help build Connecticut’s future health and technology workforce and to encourage bioscience commercialization in the state, she said. For their summer research projects, each college student was paired with a research mentor from one of the host institutions. 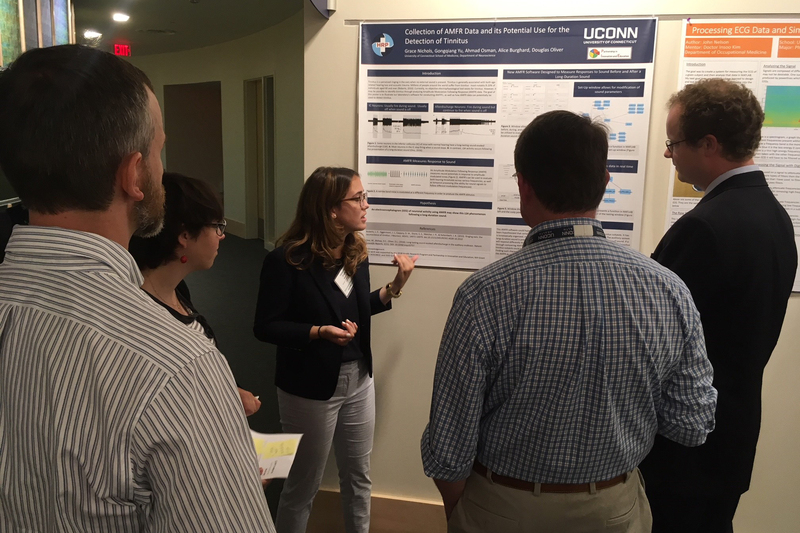 The majority of mentors were UConn Health faculty members or biotech start-up company researchers in the Farmington-based UConn Technology Incubation Program (TIP). Additionally, students and faculty took part in weekly workshops, seminars, and other training in innovation and technology entrepreneurship. 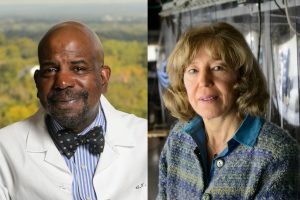 The keynote speaker at the Aug. 1 event, Susan Froshauer of Yale University, told the students they are at the heart of Connecticut’s future bioscience ecosystem. “You are so lucky,” she said. “You can pursue any of the very exciting science and technology careers.” Froshauer is entrepreneur-in-residence at the Yale Office of Cooperative Research and leader of its CURE Commons accelerator programs. Mostafa Analoui, executive director of venture development at UConn, said the learning experience incorporating diverse students from seven universities was a very special opportunity. 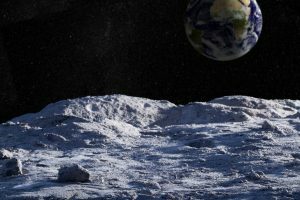 “I cannot wait to see what happens next year,” he said. 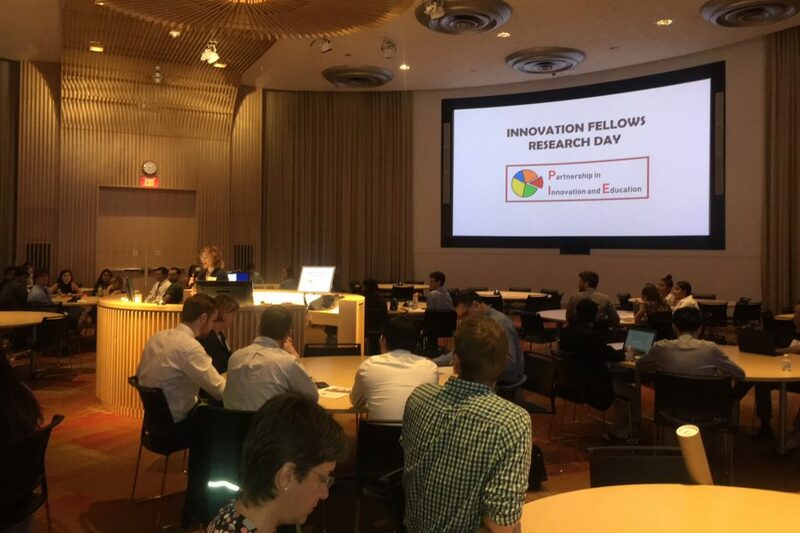 Several local legislators also attended the first Innovation Fellows Research Day at UConn Health, showing their support for the initiative and sharing their excitement about the students’ research pursuits. “Just being here and seeing this kind of synergy is very exciting,” said State Sen. Terry Gerratana (D), representing Farmington, Berlin, and New Britain. “I am so impressed by the energy and the poster boards,” said State Sen. Tony Hwang (R), who serves the towns of Easton, Fairfield, Newtown, Weston, and Westport. Erin Gibbons ’18 (CLAS) of Southbury graduated this May from the University of Connecticut’s College of Liberal Arts and Sciences with a degree in biology. As a PIE fellow she was paired with research mentor and UConn alum Ashley Kalinauskas of the UConn TIP company Torigen, a firm that is dedicated to helping pets live longer after developing cancer. Gibbons worked on developing and validating protocols to be used in the TIP company’s upcoming study involving canines with cancer, and testing vaccine efficacy for future product development. She believes her summer PIE program experience will help her this fall as she begins her Ph.D. studies in immunology. 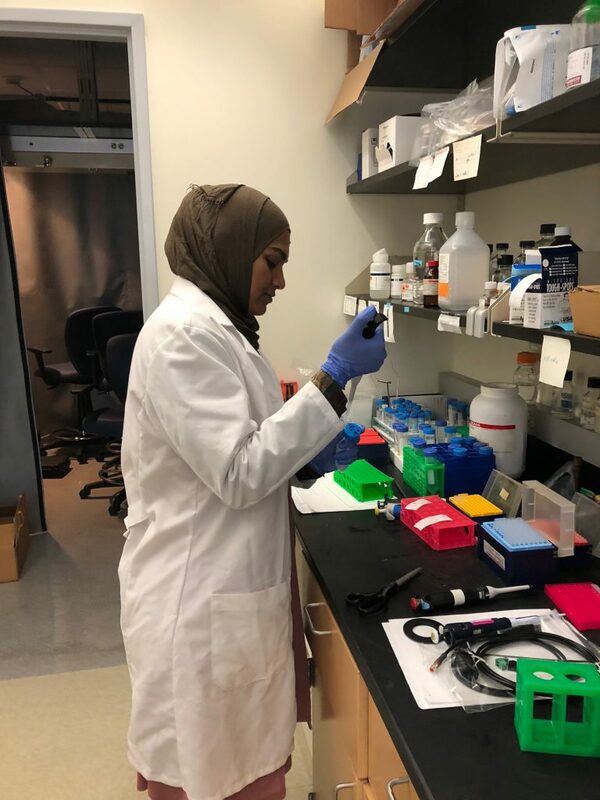 Affrin Ahmed of Bloomfield is a second-year international graduate student at UConn Storrs majoring in applied genomics. “The program challenged my abilities and enabled me to grow as a better student researcher,” said Ahmed, who was paired with UConn Health faculty mentor Dr. Ji Yu. Her summer research project worked toward developing a technique to quantify the bindings of a protein-specific domain called SH2 to a class of activated (tyrosine phosphorylated – pY) protein in specific cell signaling pathways, known as RTK (receptor tyrosine kinase) signaling pathways. These abnormal RTK signals generate dysregulated SH2-pY bindings that are associated with various human cancers. Justin Pranulis of Bristol is pursuing a master’s degree in neuroscience at the University of Hartford. This summer he conducted research with UConn Health faculty member Ahmed Zeeshan, an assistant professor of genetics and genome sciences and assistant director of Bioinformatics: Medical Dean’s Precision Medicine Program. Pranulis presented his summer research project on Next Generation Sequencing (NGS), a growing concentration in the field of genomics that has improved the field in many ways, and the high-tech software his UConn Health mentor’s laboratory uses and how it is applied. Khushbu Patel of Wallingford is a sophomore at Southern Connecticut State University studying molecular biology. Her summer research project was also overseen by UConn Health faculty member Zeeshan. Patel’s research innovation project focused on electronic healthcare data management systems and learning to how to analyze healthcare data to promote practice transformation. Paulina Szarejko is a biology major at Central Connecticut State University. 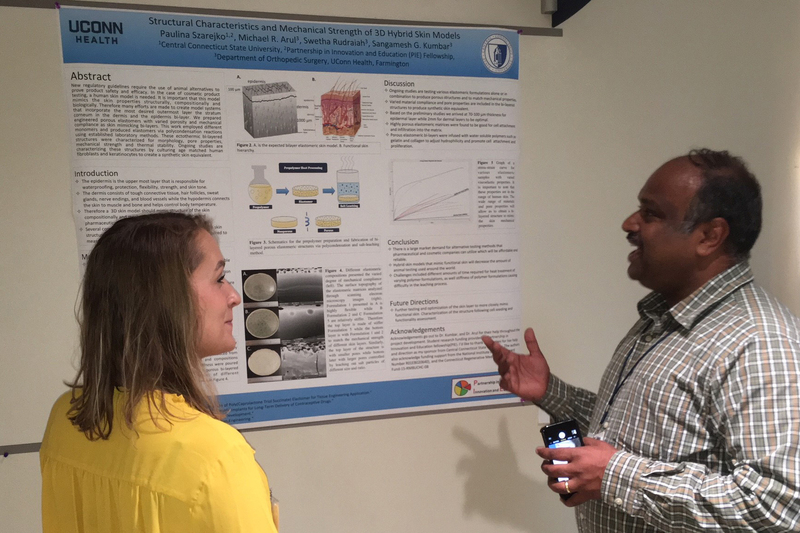 This summer she worked on a commercialization project with mentor Dr. Sangamesh Kumbar, associate professor of orthopedic surgery and biomedical engineering at UConn Health. “I learned something new each day,” she said. 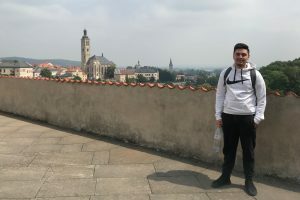 Szarejko researched how to synthesize a new polymer with varied physicochemical properties and documented the results. She worked on the structural characterization and mechanical strength of 3D hybrid skin models, as well as creating microspheres for the encapsulation of drugs for long-term drug delivery applications. The 3D hybrid skin models she’s been working on may eventually be used by cosmetic companies to replace animal testing for the toxicity of cosmetics. Her mentor, Kumbar, said he is passionate about training future scientists in the laboratory setting. He believes the program was of mutual benefit to both the student and his laboratory, and said the experience will make a huge difference in a student’s future graduate school career and development in the workforce . 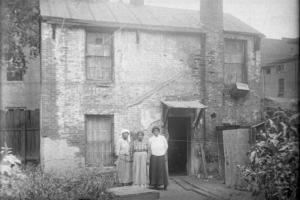 Learn more about the PIE Program here.